Old map by BLAEU -Europa recens descripta a Guilielmo Blaeuw. Title: Europa recens descripta a Guilielmo Blaeuw. Size: 14.2 x 18.1 inches. 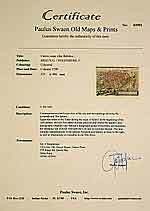 Condition: Short margins, as issued. One very small tear (3mm) in the lower margin not effecting the printed area. Good and dark impression. A very fine copy of this rare variant. 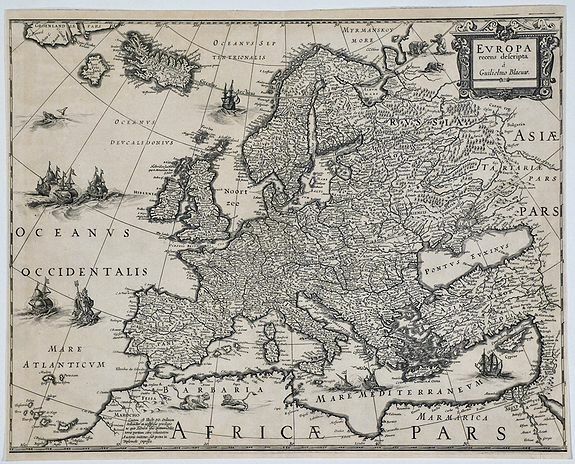 A rare variant of Blaeu's more common "carte a figures" map of Europe. During the printing process the figured borders have been covered. There exists a continent map of the Americas and Asia which has been printed in the same way. Many of his early country maps, like those of the Netherlands, France, Spain etc. had also figured borders: all these were sacrificed in order to make the maps fit into atlases or like this one in Emanuel van Meteren's Meteranus Novus (1633). No text on verso.